“Raz” on the Lead Adventure Forum was working on some Epic Stormboyz, planning to add smoke plumes coming from the jump packs. I remembered that I had these guys packed away and decided to take a photo for reference. So I decided to put the photo up here. I think that they still look cool seventeen years later. 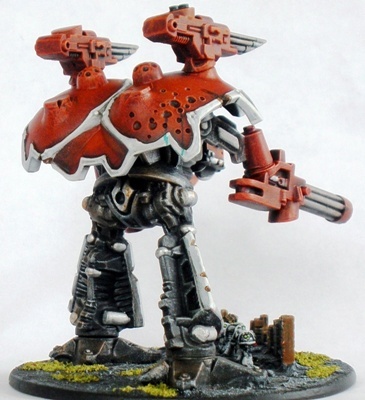 Warlord rear view. Note the Sin Eater Marines at its feet. The navy units have the same scheme as the legion as they are intended to represent Praetorian or Skitarii titan legion support troopers. The fighters and bombers are EM4 miniatures rather than “official” GW stuff, not that it matters. 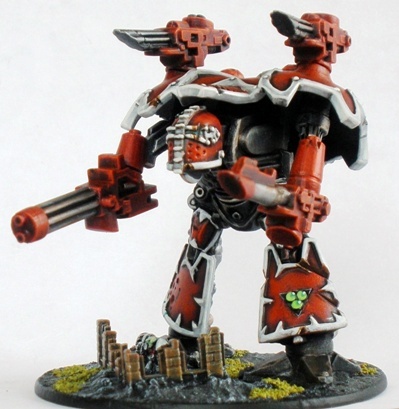 In the WH40k universe it doesnt get much more elite than these guys. Even in this scale Terminators are fun to play simply because of the disproportionate presence that they have on the battlefield. More Epic Sin Eaters. This time its some of the armoured elements. My Chaos Space Marine Chapter is the Sin Eaters. I put together a large 40k army of Sin Eaters from ’99 to ’02 or so. They were pretty nicely painted and I won a few prizes for them as a result. I will be putting up some photos of those guys at a later date. To complement my 40k Sin Eaters I put together an Epic (6mm) Sin Eater force in ’04. I am a big fan of the look of games played in this scale: it gives a better impression of large battles than 28mm and allows for a very grand perspective. Adeptus Titanicus was my first GW game and as a result I have a soft spot for the scale. The Sin Eaters were always played as a Nurgle force, even though I used a lot of Imperial marine pieces when putting them together in both scales. As a result you will see some rather theatrical wear and tear effects on these miniatures, in keeping with the Nurglesque corruption motif.